When you want to say “congratulations” there’s no better way to show that you care than with a thoughtful gift and a few kind words. Here at the Gourmet Chocolate Pizza Company, our celebratory range is the perfect way to say “yay”! Whether they’re starting a new job, passed an exam, are moving to a new house, welcomed a baby in to the world, or got engaged, who wouldn’t be happy to receive a chocolate gift to celebrate their achievements? Below, you’ll find our range of chocolate celebration gifts all made using our premium gourmet chocolate…. When you want to say congratulations, or celebrate some exciting news, there are dozens of ways to show you care, but our favourite is through the medium of chocolate! Our Congratulations pizza is the perfect way to say “yay!” no matter whether it’s passing an exam, starting a new job, or perhaps even celebrating an engagement, say it with chocolate. 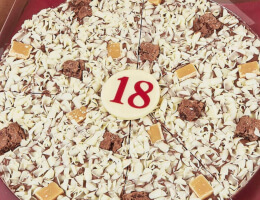 Our 7” pizza features a milk chocolate based topped with white chocolate curls, jelly beans, rainbow drops, and puffed rice and is topped with a decorative (and edible) white chocolate plaque which reads “Congratulations”. 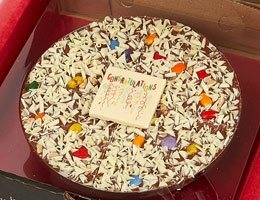 For a larger celebration (or perhaps for a super special occasion), why not opt for one of our chocolate pizza pyramids? A true show-stopper, choose three of our delicious gourmet chocolate pizzas; one 7 inch, one 10 inch, and one 12 inch, all wrapped in a gorgeous red ribbon and topped with a bow! Pick and choose any combination of our delicious gourmet pizzas including best-sellers such as Honeycomb & Marshmallow, Raspberrymac, Yummy Scrummy, and Double Dark & Delicious, just to name a few! If you’re feeling creative, why not design your own chocolate pizza? 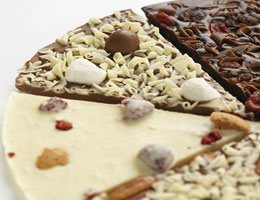 Our bespoke chocolate pizzas offer you the chance to create a chocolate pizza made with all their favourite things. Choose from a dark, milk, or white gourmet chocolate base, add chocolate curls, and three toppings of your choice. It’s the perfect way to show them that you know them. 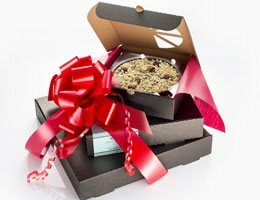 Say congratulations with the Gourmet Chocolate Pizza Company today!